The archive decompresses to a 3.26 GB vdi file. Important: If you just want to translate, you do not need the VirtualBox image. You can instead use the much smaller Apertium Simpleton UI. It automatically logs in to a 1024x768 desktop. All passwords set to 'apertium' for when root is needed. Keyboard and timezone are set to Danish, but you can change the keyboard layout from the top right widget. On the desktop is apertium-kaz-tat which works - compiling and testing that language pair should pretty much guarantee all required tools are installed and functional. Nothing else from svn is left checked out - all was wiped after installing in order to save space. The image is set up as a dynamically expanding hdd with max size 64 GB, where 8 GB is allocated to swap space. 1. Download the file (http://tinodidriksen.com/uploads/Apertium-VirtualBox-20170911.7z). 2. Use 7-Zip or a similar program to unzip the file. There should be exactly one thing in the unzipped folder - the Virtual Disk Image (VDI) entitled Apertium (Lubuntu 16.04). 3. 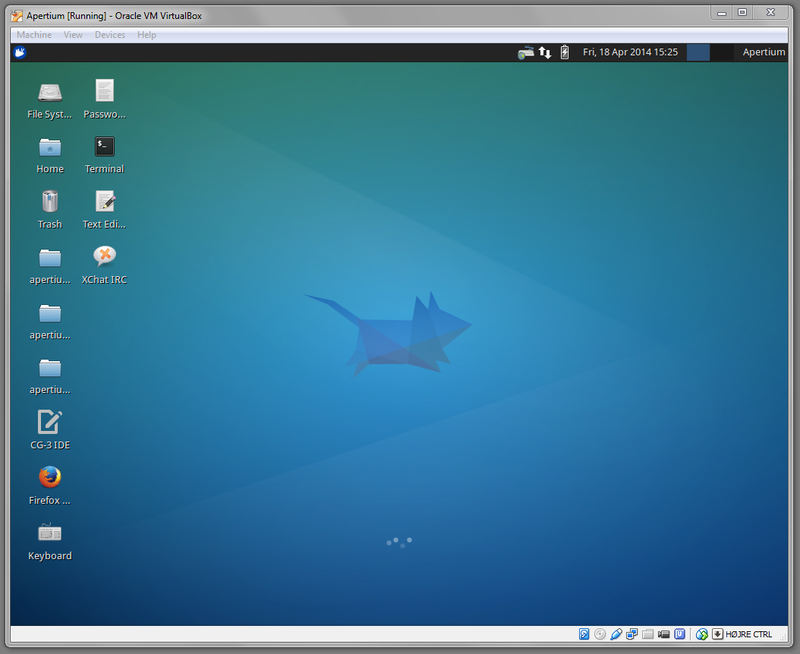 Start VirtualBox and click "New" to create a new virtual machine. 4. For the OS Type, select Linux, Ubuntu (32 bit). 5. For Memory, give it at least 1024 MB RAM - it might run with less, but the more the better. 6. For Hard Disk, select the "Use an existing virtual hard drive file" radio button. Pick Apertium (Lubuntu 16.04).vdi from the drop-down menu, or if it isn't there, click the folder icon with the green arrow to the right and navigate to wherever you unzipped the file to. Finish the process by clicking "Create". Now you should have a system with all the prerequisites installed, and you should be able to follow How to bootstrap a new pair to install a language pair (and possibly any required language modules). To get the clipboard working between the virtualbox and Windows/OS X, go into Options of that VBox -> General -> Advanced tab -> Clipboard -> Bidirectional. Click "Devices" → "Shared Folders" and find a windows folder you want to share, giving it a name like Shared. Tick "Make Permanent". To mount it on each reboot, do sudo gedit /etc/rc.local and write sudo mount -t vboxsf Shared /media/windows-shared before the "exit" line. To install a released apertium language pair in Apertium VirtualBox, just run the following, substituting "nno-nob" (Nynorsk-Bokmål) with the language pair of your choice. There are several ways you can use a language pair. 1. You can pipe text through it, e.g. 2. You can use it in interactive mode, by running it and typing text, e.g. 3. You can use it to translate a file; if you add a second filename, it'll output to that file, e.g. 4. You can also run a file through it by piping the file's contents through it, e.g. This page was last modified on 11 September 2017, at 14:20.